Working parents will be able to save up to a maximum of £4000 on childcare costs with the new tax-free childcare scheme due to be introduced by the government early this year. Part of the criteria is that parents will have to be in work, and each earning at least £115 a week and not more than £100,000 each per year. 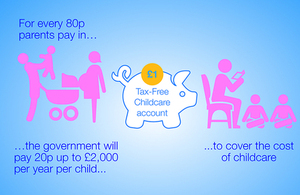 And unlike the existing scheme, the new Tax-Free childcare won't require employers to offer the scheme.